A meaningful “飲茶” event is being organised by the Rotaract Club of Lap-Chee College on 11th Nov, 2017. 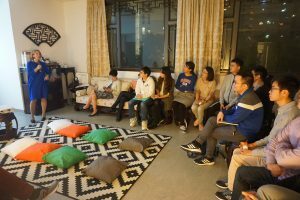 Nearly a hundred elderlies are invited to HKU and Lap-Chee College to enjoy a family-like “飲茶” session with Lap-Cheers from all over the world. In addition to delicious dim sum, traditional Chinese performances such as Erhu and Guzheng are being performed by our very own talented Lap-Cheers. 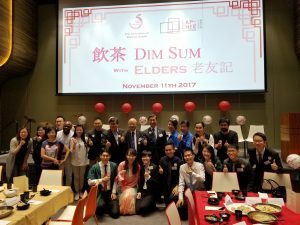 This event provides a rare opportunity for residents in Lap-chee college to mingle with local citizens and to give back to local communities. 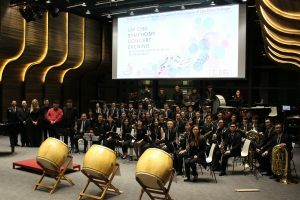 In celebration of our 5th anniversary, Lap-Chee College is proud to present to you the Lap-Chee​ Symphony Concert Evening, featuring an award-winning local symphonic band: Shinywinds. ​This free event is open to HKU staff/students/alumni and the public. Limited seats are available and offered on a first-come, first-served basis. Online registration is required and walk-ins will be made available 10 minutes prior to the commencement of the Concert. The HKU Mooncakes for the Elderly Project 2017 (September 23rd and September 30th, 2017) Recruiting 300 volunteers comprising of current students and alumni, Lap-Chee College worked in collaboration with various community organizations dedicated to elderly care around Kennedy Town and Aberdeen to visit and bring mooncake giftbags to the elderly. 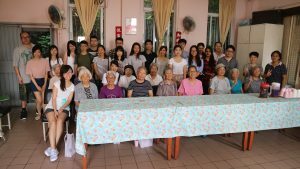 Over the two Saturdays, the College has managed to run 6 successful sessions of home and centre visits; distributing over 400 low-sugar mooncakes, packets of oatmeal, and cartons of soy milk. Lap-Chee College is celebrating its 5th anniversary this year. During its brief but vibrant history, the college has been actively involved in the community as a manifestation of its philosophy. The Mooncakes for the Elderly Project is one of the many meaningful community service events of Lap-Chee College. If you are interested joining us for future events, please like our facebook or contact us at lapcheecollege@hku.hk for more details. We aim at providing a broad platform for all postgraduate/undergrad students to make friends, to create research networks, and to share interesting ideas. This project is run by Lap-Chee College. We are very much looking forward to seeing you there! !